We’d love your help. Let us know what’s wrong with this preview of Walking with the Wind by John Lewis. An eloquent, epic firsthand account of the civil rights movement by a man who lived it-an American hero whose courage, vision, and dedication helped change history. The son of an Alabama sharecropper, and now a sixth-term United States Congressman, John Lewis has led an extraordinary life, one that found him at the epicenter of the civil rights movement in the late '50s an An eloquent, epic firsthand account of the civil rights movement by a man who lived it-an American hero whose courage, vision, and dedication helped change history. The son of an Alabama sharecropper, and now a sixth-term United States Congressman, John Lewis has led an extraordinary life, one that found him at the epicenter of the civil rights movement in the late '50s and '60s. As Chairman of the Student Nonviolent Coordinating Committee (SNCC), Lewis was present at all the major battlefields of the movement. Arrested more than forty times and severely beaten on several occasions, he was one of the youngest yet most courageous leaders. To ask other readers questions about Walking with the Wind, please sign up. There are precious few figures in American politics with anything like the moral authority of John Lewis. Out of the civil rights movement of the mid-20th century, he is one of the survivors of the marches, of the police beatings, of the long fight for personal freedom and equality under the law. The subtitle, 'A Memoir of the Movement', is apt. Lewis spends only a little time recounting his childhood (sharecropper parents, rural Alabama, dreams of being a priest), and barely a chapter on his political career. The bulk of the book concerns Lewis' life and activities in the civil rights movement. This starts with his exposure to student movements at the American Baptist Theological Seminary. The book then follows the rise of Student Nonviolent Coordinating Committee (SNCC) and non-violent protests - sit-ins in 1960, freedom rides the year after that, 'freedom summer' of 1964, and then Selma in 1965. The depictions of the protests and the marches are immediate and gripping - Lewis remembers the sound of police on horseback, the crack of the baton, the white bystander yelling 'Get those n-ggers!' And still the movement went on. Lewis provides his own view of the evolution of the civil rights movement and its interactions with the student movement and black nationalists. He remains committed to his Tolstoyan-Gandhian view of non-violence as the only moral and effective answer. The decentralization of SNCC, which was crucial in the early stages of the movement for increasing recruitment and acting in a wide geographical span, came under fray due to the groaning weight of multiple factional squabbles and a radical wing which agitated towards violence. Lewis was eventually forced out of SNCC leadership by Stokely Carmichael in 1967. This autobiography is subtitled A Memoir of the Movement and, yes, the story of the Civil Rights Movement is the main focus; but it’s also more than that. Lewis begins with his childhood, his life with his hardworking parents in Alabama. He feels different from his parents, from his siblings, he wants more. He hides until he can catch the school bus, instead of working in the cotton fields. He awakens to what that ‘more’ is the moment he hears Martin Luther King, Jr., on the radio preaching a “s This autobiography is subtitled A Memoir of the Movement and, yes, the story of the Civil Rights Movement is the main focus; but it’s also more than that. Lewis begins with his childhood, his life with his hardworking parents in Alabama. He feels different from his parents, from his siblings, he wants more. He hides until he can catch the school bus, instead of working in the cotton fields. He awakens to what that ‘more’ is the moment he hears Martin Luther King, Jr., on the radio preaching a “social gospel.” At the articulation of what he’d been in search of, he feels an instant connection, an awakening, and never looks back. Some of the events detailed in this book were familiar to me from the March trilogy of graphic novels, but it was great to get more detail, especially since in March I found the different names of the different people in various groups, some of which overlapped, rather confusing. I was once again touched by the account of Lewis’ childhood, especially at his care and love for his chickens from the time he was four years old. I was moved by his reactions after the murders of King and Robert Kennedy. I teared up at the end of the chapter that accounts Lewis’ first Congressional win. Reading March, I'd struggled with understanding how these courageous young people could endure such physical violence. Lewis does a great job explaining that here, though I still marvel at their nonviolent “tactics,” which include making eye contact with their attackers; picturing them as innocent babies and as victims of their upbringing; and loving them. As Lewis says, you have to believe in all of this with your whole being, as a way of life. Not many can do what he's done and I started to think of him as a ‘saint.’ When I read of a Times magazine article naming him (along with other individuals like Mother Teresa) a “living saint," I realized what I’d been thinking wasn’t a stretch. Lewis loves humanity, individually and collectively, and he has empathy to spare. In the last chapter he warns of the consequences of the track we're on, and says he feels he’s living in the past in many ways—this book was published in 1998. March, published later, speaks of Lewis’ hope and encouragement when Obama was elected, but I know Lewis is back to feeling the way he did in 1998—and, likely, worse. 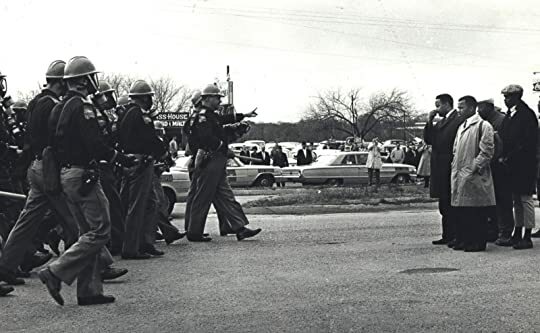 Personally, I am struck by how similar the conditions at the U.S.-Mexican border right now seem to those in 1965 that led to Bloody Sunday on the bridge in Selma. I finished the book yesterday, Election Day in the U.S., appropriate as Lewis fought so hard, almost losing his life, in his efforts to ensure that the 15th Amendment was enforced in every state. Some people think John Lewis is "all talk" and has "never done anything" but those people are idiots and should be treated as such. John Lewis is a Congressman, Civil-Rights Icon, Husband, Father, and Servant For Justice. John Lewis did more before the age of 25 than most people will do if they live to be 125. As a college student Congressman Lewis led efforts to desegregate Nashville through sit-ins. His guidelines became the rules by which all other nonviolent activists in the civil rights move Some people think John Lewis is "all talk" and has "never done anything" but those people are idiots and should be treated as such. John Lewis did more before the age of 25 than most people will do if they live to be 125. As a college student Congressman Lewis led efforts to desegregate Nashville through sit-ins. His guidelines became the rules by which all other nonviolent activists in the civil rights movement would follow. In Selma he was nearly beaten to death by state troopers. Even in his sixth decade as a freedom fighter Congressman Lewis continues to fight the good fight. In the 60's he fought against the racism of George Wallace and today he leads the fight against the racism of Donald Trump. John Lewis is an American Hero and I recommend this book and The March Series to anyone who wants to see courage in action. In the wake of the presidential election of 2016 and reports that Russian hackers had influenced the outcome in favor of Donald Trump, Congressman John Lewis was quoted as saying “I don’t see the president-elect as a legitimate president” and that he would not be attending the inauguration. Mr. Trump, never one to allow a criticism to go untweeted, reached for his always handy phone on the eve of the Martin Luther King holiday and tweeted that Lewis should “spend more time on fixing and he REREAD. Journalists and other individuals were quick to point out that Lewis’ personal history was characterized by much action and little talk. Furthermore, many of them pointed out that his district, which includes some of the more affluent sections of Atlanta, was doing much better than Trump indicated. One of the by-products of the dispute was that Lewis’ books experienced resurgence in sales. 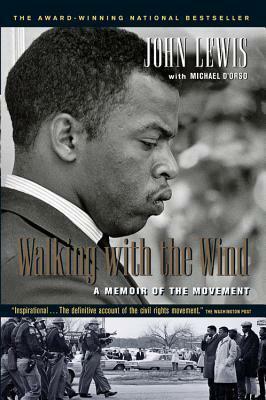 His autobiography, Walking With the Wind: A Memoir of the Movement, sold out on Amazon with used copies going for nearly a hundred dollars. The March trilogy went to number one and also sold out. Across that Bridge: Life Lessons and a Vision for Change sold out as well. Was Trump ignorant of Lewis’ personal history or was he gambling that the public had forgotten or was unaware of the passionate and courageous actions of a man of peace who still in his early twenties rose to the top of one of the major organizations in the civil rights movement of the 1960s? Did he know that Lewis, dedicated to the principles of nonviolent protest against injustice, was arrested forty times; was imprisoned for forty days in the Mississippi State Penitentiary; was beaten and knocked unconscious during the Freedom Rides; and sustained a fractured skull at the Edmund Pettus Bridge in Selma, Alabama? Did he know that Lewis was the youngest person to speak at the historic March on Washington and is the last living person to have done so? Lewis writes in Walking With the Wind that his well-known stubborn streak and his religion were keys to his dogged attachment to his principles that allowed him to survive the 60s. In 1986, Lewis was elected to the House of Representatives. Every two years since then he has been re-elected. In a total of sixteen elections, including 2018, he ran unopposed seven times. In only one of those elections did he receive less than seventy per cent of the vote and in that one he received sixty-nine per cent. He has been called “the conscience of Congress.” I don’t think that goes far enough. For many years this son of Alabama sharecroppers has been “the conscience of the nation.” You name it and John Lewis was there. life changing and country changing movement in school. That should change! funerals for those who had died. the major walks and protests that took place around the south. over the head with a bat - it was amazing. John Lewis is a true American hero. He grew up dirt poor in rural Alabama. He left home for religious studies in Nashville in 1958, but quickly became involved in the burgeoning civil rights movement. John Lewis always had an innate sense of right from wrong – and he knew segregation was evil and anti-humanitarian. He became increasingly involved as a pacifist protester. He was influenced as well by the actions and non-violent doctrine of Dr. Martin Luther King who a few years before had succeed John Lewis is a true American hero. He grew up dirt poor in rural Alabama. He left home for religious studies in Nashville in 1958, but quickly became involved in the burgeoning civil rights movement. John Lewis always had an innate sense of right from wrong – and he knew segregation was evil and anti-humanitarian. He became increasingly involved as a pacifist protester. He was influenced as well by the actions and non-violent doctrine of Dr. Martin Luther King who a few years before had succeeded in desegregating the buses in Montgomery, Alabama. So John Lewis, with a group of like-minded people, began training in non-violence to break-down the segregation at lunch-counters in Woolworth and other assorted stores in Nashville. This autobiography is visceral – John Lewis was beaten on several occasions and was arrested multiple times. He encountered racism head-on and did not flinch. He always maintained his non-violent position in front of often barbaric policemen and authority figures. Not only did he participate in trying to integrate lunch counters, but he was in the “Freedom Rides”, he spoke in the March on Washington in 1963, and he went to rural Alabama and Mississippi to attempt to register black voters. He was beaten unconscious in Selma, Alabama in a voter march. We get close-up views of the participants in the civil rights movement. Mr. Lewis is not afraid to express his opinion on many of them. He also knew the value of having the media close by during the protracted and often violent confrontations in the Jim Crow South. The level of hatred of many white southerners towards both the protestors and the media is astounding. John was chairman of SNCC (Student Non-violent Coordinating Committee) from 1963 until 1966. Their main goal during that time period was to register black voters in the South. During 1965 SNCC began to splinter – some members wanted SNCC to become more aggressive and renounce non-violence, and there were others who did not want white members. John Lewis was opposed to both these options – he was always committed to both non-violence and an integrated America. He resigned from SNCC. John Lewis is a religious person but he does not overwhelm you with this in his story. He points out the essential role of the church, and the activist women in the church, who often provided a safe haven from the dangerous outside world. The church was often the rallying point for the Civil Rights movement. John Lewis continued his political activism. Eventually he ran for Congress in 1987 in Atlanta, Georgia and won. What a transition! From being a protestor with multiple arrests, to becoming a U.S. representative in Washington D.C.! This is a remarkable and gripping journey. It is very insightful and essential to an understanding of the United States in the latter half of the 20th century. They were the rank and file, in Selma, in Americus, in Little Rock, everywhere. You see their faces today in photographs in history books and nobody knows their names. That young guy sitting stoically at the lunch counter in Jackson with mustard streaming down his face and a mob of white hoodlums crowded around him and taunting and laughing – who is he? Where is he today? The young man whose pants leg is being torn by a snarling German shepherd in Birmingham – what is his name? Where is he? Whatever happened to the little girl who was turned head over heels by those fire hoses? This is probably the best movement memoir (from any movement) that I have ever read. John Lewis is just the kind of solid person that every movement needs more of: principled but not dogmatic; combining patience for the people with impatience for injustice; focused on getting results more than getting credit; stodgy rather than flashy; deeply aware that it is the masses who actually make history; always prioritizing organizing over getting mass media publicity. He is not without pride, and he is This is probably the best movement memoir (from any movement) that I have ever read. John Lewis is just the kind of solid person that every movement needs more of: principled but not dogmatic; combining patience for the people with impatience for injustice; focused on getting results more than getting credit; stodgy rather than flashy; deeply aware that it is the masses who actually make history; always prioritizing organizing over getting mass media publicity. He is not without pride, and he is gifted with an amazing -- and self-admitted -- stubbornness, but he is also openly self-critical. His autobiography is unshy about its author's true feelings on everything that happened and everyone he knew in those heady and violent days of the movement he helped lead. Lewis is also forthright about his continued commitment to a politics which can seem quaint in our own time: he still believes in the "Beloved Community," and is attached to the principles of militant nonviolence that he learned from James Lawson in Nashville forty years before he wrote this book (and fifty years before our own time). Nonviolence not only as a powerful tactic, but as an extension of a religious (not just almost-religious) view of the world. This book was amazing and a great history lesson. I'm a congressional staffer and I've always had to contain my excitement whenever I passed Rep. John Lewis in the hallway. I knew that he marched with MLK during the civil rights movement and that was enough to earn my eternal respect and admiration. I finally got around to reading his book and was even more amazed. He began working in the civil rights movement when he was a sophomore in college. He was literally at every major event in the civil This book was amazing and a great history lesson. I'm a congressional staffer and I've always had to contain my excitement whenever I passed Rep. John Lewis in the hallway. I knew that he marched with MLK during the civil rights movement and that was enough to earn my eternal respect and admiration. I finally got around to reading his book and was even more amazed. He began working in the civil rights movement when he was a sophomore in college. He was literally at every major event in the civil rights movement and beyond. He was in the Ambassador Hotel as a RFK campaign staffer when he was assasinated. He spoke at the March on Washington. He was there on "Bloody Sunday" one of the worst days of the civil rights movement. He was there for the march from Selma to Montgomery. He was there for the Freedom Rides. He did most of these things before he was 25! I think we as young people forget how close history is to our own lives. Reading this book reminds me that this man has lived through amazing change in his lifetime, more than I can ever hope to see, and the fact that I can walk by him in a hallway tells me that his story is not a history book yet, it's a story that is still being written. This book should be required reading for everybody, especially students and those with power. The Beloved Community should be the goal of all people. John Lewis is an amazing man and it is a wonder that he is not better known in today's world. He is a hero and should be treated as such. There are not enough words in the English language for me to describe how wonderful this book is. It is not only, by far, the best book on the Civil Rights Movement I have read as of yet, it is the best book I have read. The best thing about it is that it is completely honest. It is straightforward and does not cast a dreamy glow over everyone involved as the majority of other books do. I learned about the differences in opinion among the different organizations, and how they were all necessary There are not enough words in the English language for me to describe how wonderful this book is. It is not only, by far, the best book on the Civil Rights Movement I have read as of yet, it is the best book I have read. The best thing about it is that it is completely honest. It is straightforward and does not cast a dreamy glow over everyone involved as the majority of other books do. I learned about the differences in opinion among the different organizations, and how they were all necessary and beneficial in their own ways. I learned all about SNCC, which until I read this book, I had only very limited knowledge of. I "met" several main players in the movement that most books don't even acknowledge, like Diane Nash and Jim Lawson. It gives a telling overview of the arch of the movement, from the 50s to the 70s, and how it changed so significantly and why. This is a must-read story of one of the civil rights' greatest names. Even people familiar with the story will learn a lot from this book. The segments that include the Freedom Riders, Birmingham, and Selma are page-turners. Very emotional and powerful. This book has been sitting on my coffee table for about 18 months. I've been looking at it and thinking, "Do I want to read that?" But I was kind of out of nonfiction, so I picked it up, and I am so glad I did. If you don't know John Lewis, he was one of the original (well, really second wave) Freedom Riders in the early 1960s. One of the most famous photos of that time is him being beaten by an Alabama policeman on the Edmund G. Pettus bridge in Selma. He was chair of the Student Nonviolent Coor This book has been sitting on my coffee table for about 18 months. I've been looking at it and thinking, "Do I want to read that?" But I was kind of out of nonfiction, so I picked it up, and I am so glad I did. If you don't know John Lewis, he was one of the original (well, really second wave) Freedom Riders in the early 1960s. One of the most famous photos of that time is him being beaten by an Alabama policeman on the Edmund G. Pettus bridge in Selma. He was chair of the Student Nonviolent Coordinating Committee. He was on the board of the Southern Christian Leadership Council. He knew Martin Luther King Jr., and Malcolm X, and Stokely Carmichael, and Bayard Rustin, and Julian Bond, and Fannie Lou Hamer, and Bobby Kennedy, and dozens of other known and unknown heroes and key figures of that time. For over 20 years, he's been a member of the U.S. House of Representatives from Atlanta, Georgia, and in 2017 he led the sit-in on the House floor to protest the dismantling of the Affordable Care Act. The title is explained in the preface. As a child, Lewis was in his aunt's house with a bunch of other siblings and cousins during a tornado, and the not-very-well-built house was groaning as if it might come off its foundation. His aunt directed the kids to march to the corners that were least stable, and hold the house down by their own weight, and then move when the wind moves. It seems that she was hoping this would work, but also trying to calm herself and the children, and give everyone something to do. And the house survived! He idolized MLK much more than I do. He's deeply inclined to make excuses for people, and that's one of the things that makes him likable. The two things that make the book for me are the authenticity of his voice throughout (either D'Orso is a brilliant ghost writer or the voice isn't as authentic as it feels) and the power of his convictions, which are remarkably close to my own. This is a great history of the civil rights movement from an atypical perspective, but a really important one. John Lewis was there for a lot of the important moments, but wasn't swept up and held on to as one of the shining stars of the civil rights movement - a central grunt worker who maybe didn't get to take enough bows for it all. I liked that the narrative connected pieces of the civil rights movement I had only ever understood in their separate parts, for example how the Black Panther Part This is a great history of the civil rights movement from an atypical perspective, but a really important one. John Lewis was there for a lot of the important moments, but wasn't swept up and held on to as one of the shining stars of the civil rights movement - a central grunt worker who maybe didn't get to take enough bows for it all. I liked that the narrative connected pieces of the civil rights movement I had only ever understood in their separate parts, for example how the Black Panther Party sort of rose up out of the ashes of the Student Nonviolent Coordinating Committee - I had no idea the two were connected at all. Also connections between A. Phillip Randolph's work with the Brotherhood of Sleeping Car Porters, Dr. King's work with the Southern Christian Leadership Council, and the SNCC's work (many actions conceived of and run by SNCC were things I had attributed to Dr. King and the SCLC). Sometimes I think Rep. Lewis holds himself up as a little more righteous than I can believe he is, and he spends a little too much energy justifying why he fell on opposite sides of a decision from some of his counterparts, but overall I appreciate the tone in which he writes this memoir, and I wish that he was more fairly represented in the commonly-taught history of this movement. If ever there was a true hero, John Lewis is surely one of them. Humility, commitment, courage and perseverance. This book gives one of the best accounts of the Civil Right movement available...and from the first hand experience of one who was on the front lines. Outstanding! Full review at my book blog, TheBibliophage.com. John Lewis creates an incredibly compelling historical memoir in Walking with the Wind. It’s one man’s experience, but it also chronicles the experience of a whole community. While it was written in 1996, so many parts ring true for today’s turbulent world. If you want to know how we got here, read this book. And if you want to know how and where we go from here, read this book. If you’ve been feeling discouraged at the social and political state of Full review at my book blog, TheBibliophage.com. If you want to know how we got here, read this book. And if you want to know how and where we go from here, read this book. If you’ve been feeling discouraged at the social and political state of the U.S., read this book. So, really, just read this book. It’s 500 pages, so you’ll be making a commitment. But when you count the literal steps Lewis has taken for the betterment of mankind since 1960, you’re not making much of a commitment. So, read this book. I don't normally read non-fiction novels, let alone autobiographies, so when I was told I needed to read John Lewis's story for class, I was not excited; usually, reading for a class takes the fun out of the book for me. However, I learned so much from this book, about leadership and the Civil Rights Movement. I had never heard of John Lewis before, but he will stand out in my mind because he showed me so much about the Movement that I didn't know or hadn't appreciated. AP US History doesn't cov I don't normally read non-fiction novels, let alone autobiographies, so when I was told I needed to read John Lewis's story for class, I was not excited; usually, reading for a class takes the fun out of the book for me. However, I learned so much from this book, about leadership and the Civil Rights Movement. I had never heard of John Lewis before, but he will stand out in my mind because he showed me so much about the Movement that I didn't know or hadn't appreciated. AP US History doesn't cover it all. The writing and storytelling is also pleasing. Although it is told like a story, it doesn't come across as fantastical. Lewis and D'Orso make the ideas and events flow together. John Lewis is a national treasure, and the last living member of the "Big 6" civil rights leaders behind the 1963 March on Washington. In this day and age, as we face a regime that aims to undo the progress made towards justice in multiple areas, it is more important than ever to hear his voice. His writing made me feel as if I was there with him and all the brave souls that were part of the movement. His warnings and observations about Newt Gingrich could easily be written about the current cro John Lewis is a national treasure, and the last living member of the "Big 6" civil rights leaders behind the 1963 March on Washington. In this day and age, as we face a regime that aims to undo the progress made towards justice in multiple areas, it is more important than ever to hear his voice. His writing made me feel as if I was there with him and all the brave souls that were part of the movement. His warnings and observations about Newt Gingrich could easily be written about the current crop of Republicans. This book is both a how-to manual for nonviolent activism and a testament to the bravery and dedication of Lewis and his peers. We must not forget that many people DIED for simply trying to register African American voters. Any time you even think about not voting, remember that. I assigned this book in one of my college classes a couple years ago. Lewis presents an amazing account of his childhood in Alabama, his work with the Student Non-Violent Coordinating Committee (SNCC), and his relationship with Dr. Martin Luther King, Jr. Lewis is an ordained Baptist Minister and believes deeply in non-violent protest as a means of social change. My favorite part of this book is Lewis's accounting of his first meeting with Dr. Martin Luther King, Jr. Lewis, who was quite a bit y I assigned this book in one of my college classes a couple years ago. Lewis presents an amazing account of his childhood in Alabama, his work with the Student Non-Violent Coordinating Committee (SNCC), and his relationship with Dr. Martin Luther King, Jr. Lewis is an ordained Baptist Minister and believes deeply in non-violent protest as a means of social change. Lewis's book is honest and open. He writes about internal conflicts within SNCC and the many personal relationships he formed during the movement. After reading this book, I felt more informed about the behind-the-scenes activities and inner-workings of the Civil Rights Movement. My rating for this book is 4 out of 5 stars. I am now reading this book from our library, but I have to have it. I want to yell from the roof tops for everyone to read it. John Lewis carefully details the decisions, the people the choices made and his part in the initial years of the Civil Rights Movement and his amazing part in SNCC. He describes his journey through the years and how he came to the decision to run for Congress from the 5th district in Georgia. I am happy to say he honorably still holds that position today. I want to be sur I am now reading this book from our library, but I have to have it. I want to yell from the roof tops for everyone to read it. John Lewis carefully details the decisions, the people the choices made and his part in the initial years of the Civil Rights Movement and his amazing part in SNCC. He describes his journey through the years and how he came to the decision to run for Congress from the 5th district in Georgia. I am happy to say he honorably still holds that position today. I want to be sure many people know about this book and will spread the word to help connect the past heroic struggles with what is going on now racially in this country. All I can say is WOW! An amazing man, a powerful story, and an incredible challenge for us today. We can, and must, fight for what is right. We must stand up to injustice. This was very well written, and was incredibly informative.